The number of laid-off Americans filing initial jobless benefit claims rose slightly last week while the number of people continuing to claim benefits set a record for the ninth straight week, the Labor Department said Thursday. The figures indicate that the labor market remains weak even as some other recent economic indicators have come in better than expected. The Labor Department said first-time claims for unemployment insurance rose to a seasonally adjusted 652,000 from the previous week's revised figure of 644,000, slightly higher than analysts expected. A year ago, the number stood at 367,000. The total number of people claiming benefits for more than a week jumped 122,000 to 5.56 million, significantly higher than analysts' projections of 5.48 million and the highest on records dating back to 1967. The continuing claims data lag initial claims by a week. The number of continuing claims has increased by more than 100,000 four times in the past five weeks, an indication that workers are remaining on the rolls for longer as they struggle to land a new job after being laid off. President Barack Obama, during an online town hall meeting Thursday, was cautious about making predictions on job creation. While he said America should focus on creating high-wage jobs based on innovative technology, the prospects for immediate job growth remained difficult in the current economy. As a proportion of the work force, the number of people receiving benefits is at its highest level since May 1983, when the economy was recovering from a steep recession. The total is nearly double the amount a year ago, when about 2.8 million people were continuing to receive unemployment checks. And that number doesn't include an additional 1.47 million people receiving benefits under an extended unemployment compensation program approved by Congress last year. That tally was as of March 7, the latest data available. Separately, the Commerce Department reported that the gross domestic product, the broadest measure of the nation's economy, fell at an annual rate of 6.3 percent in last year's fourth quarter, slightly worse than the previous estimate of 6.2 percent. 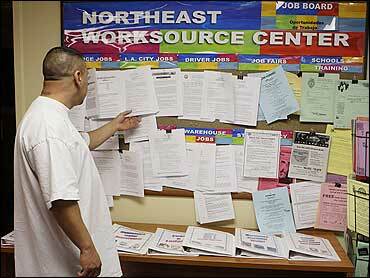 The recession drove the unemployment rate to 8.1 percent last month, the highest in more than 25 years. Many economists expect the rate could reach 10 percent by early next year. The four-week average of initial claims, which smooths out fluctuations, dropped slightly to 649,000. Last week it reached its highest level since October 1982, though the work force has grown by about half since then. But some analysts think the slowing rate of new job losses is a positive sign for the economy. "One sign that we may be nearing the end of the worst part of the problems in the labor market is that the claims are not accelerating and they're not rising very rapidly," Joel Naroff, chief economist at TD Bank, told CBS News. More job losses were announced this week. On Wednesday, Shaw Industries Group Inc., the world's largest carpet maker and a subsidiary of Warren Buffett's holding company Berkshire Hathaway Inc., said it would close two plants in Georgia and lay off about 600 workers. On Tuesday, pharmaceutical company Hospira Inc. said it would cut 1,450 jobs, or about 10 percent of its work force, while beleaguered automaker General Motors Corp. said it laid off 160 engineers, the beginning of 3,400 planned cuts among its salaried employees. GM has said it will cut 47,000 jobs worldwide this year.